In 1961 Professor Ronald Bracewell at Stanford University created an X shaped array (called a “Chris-Cross array” for W.R. “Chris” Christiansen) using 32 10-foot diameter dish antennas to form a radio spectroheliograph nestled in the hills of Palo Alto, California. 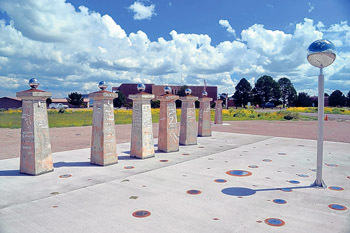 Tom Carpenter, a member of the Hampton fire company for 44 years, presented plans for a 9/11 memorial to the Borough Council at the beginning of 2012 and Councilman James Cregar began designing the memorial as a sundial using beams recovered from Ground Zero of the Twin Towers. 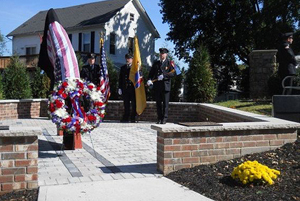 Read more: 9/11 Timeless Sundial Dedicated In Hampton, N.J. The Battle Point Astronomical Association, founded in 1992, provides astronomical observing for science education and public enjoyment at Ritchie Observatory and Planetarium in Battle Point Park on Bainbridge Island, Washington. Sitting peacefully in the garden of the Oatlands Historic House and Garden near Leesburg VA, is a beautiful, but sadly in need of repair sundial. Each year the Virginia Association of Museums, comprising over 500 museums and historical sites within the state, receives nominations for conservation of Endangered Artifacts. Kevin Murphy, artist and photographer, set up a time-lapse camera on the roof of the San Francisco Exploratorium to record the sky every 10 seconds, 24 hours per day for an entire year. The camera points due north at and elevation of 45 degrees, which means that you won’t see any dramatic sunrise or sunset, nor will you see a burning image of the sun. Even with the wide-angle lens, the sun is always kept just out of view. But what a wonderful view of the sky: Look closely at the video and you’ll see moving clouds, fog, rain, and differing colors of the sky. Most stunning is the changing length of the day. Summer morning twilight begins about 4:10am (Pacific Standard Time) and evening twilight ends about 8:10pm, but you must be patient for the winter sky to appear. Winter morning twilight begins about 6:50am (PST) and evening twilight ends about 5:30pm. (There’s a small running clock in the bottom right corner to chart your progress). You’ll see the dramatic difference between summer and winter with days in darkness patiently waiting their turn at sunrise and conversely, the fast quenching of the blue sky into darkness well before the summer frames show any sign of paling. Each frame is digitally photographed at 1024x768 pixels, that with compression, requires about half a terabyte storage per year. Kevin Murphy has been creative with the sky display: Thumbnail videos of each day of the year are collectively represented in a tiled mosaic 20 days wide by 18 days tall, showing 360 days of sky all at once. The images are arranged chronologically, and are synchronized by time of day, beginning before summer sunrise. Time is compressed in playback at 24 frames/second so that each second represents 4 minutes of time. This is still a work still in progress: As the camera on the Exploratorium roof continues to collect images of the sky, they will be integrated into the daily montage. Therefore the video will vary from day to day, always displaying the most recent 365 days. Visit http://www.murphlab.com/hsky/ for more information. Below is his video. It’s best played in full-screen HD resolution. 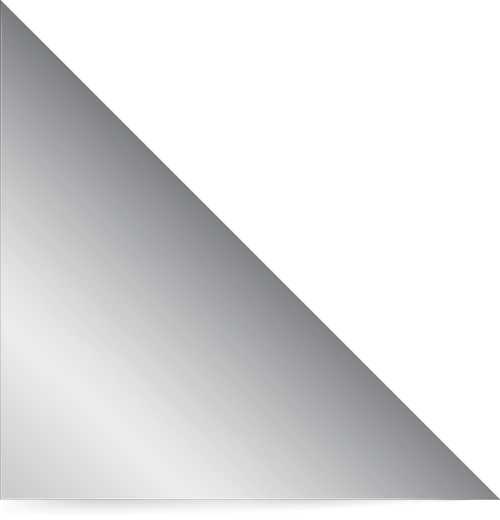 Click the middle arrow to start, then click the bottom right frame box. 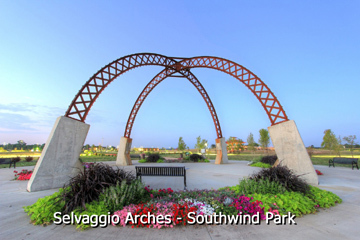 Southwind Park in Springfield Illinois is a National Model Park. It got its start in October 2004 when trustees accepted the donation of 80 acres of land just off South Second Street. Their website states "Our unique state-of-the-art park serves as a national model by proving a new dimensions of inclusion for all people." A park without boundaries that accomodates people in wheelchairs and visitors with special needs. Many sundials do not survive the raveges of time. Buildings are destroyed and the sundial goes to oblivion. 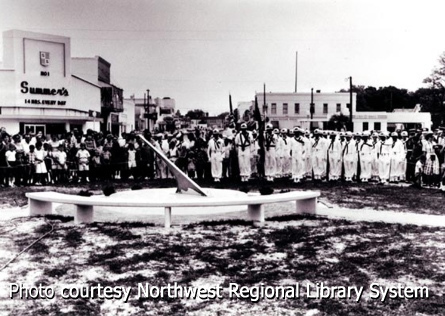 However, Panama City Commissioners had a different view of the sundial once located across from the Marina Civic Center. In the May 14, 2013 edition of The Seattle Times University of Washington professor Woody Sullivan was honored as ‘Mr. 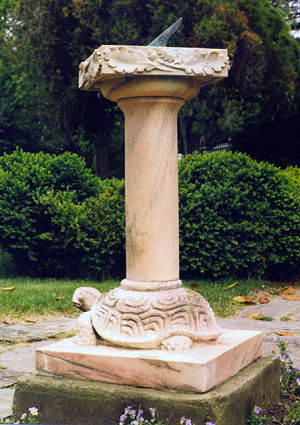 Sundial’ for his persistence in declaring Seattle as the Sundial Capital of North America. Dr. Sullivan has worked on more than a dozen dials in Seattle, including the large 20x30 foot vertical dial on southwest wall of the Physics and Astronomy building at UW and the elegant 11x17 foot reflection sundial painted on the ceiling of his garage at N 47° 41.232, W 122° 21.562. A small circular mirror outside the south facing window reflects a spot of light onto the ceiling. The reflection sundial was a labor of love taking over 3 years to create. 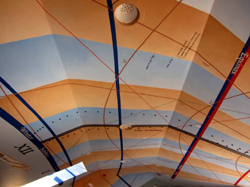 Woody marked over 700 locations on the ceiling that allowed him to draw the local solar time, dates, hours of daylight, solar azimuth and altitude, analemma, and even hours to dawn. And being a radio astronomer, he marked the transit sidereal time for two radio sources. The dial was painted with marvelous beauty by a local mural artist, Jim Noonan. The sundial is very personal to Woody, showing time marks for the date he married to the birthdays of himself, his wife, and two daughters. The zodiac painted along the ecliptic has a local touch, representing Pisces by a pair of sockeye; Cancer by a Dungeness crab; and Capricorn as a mountain goat. There is even a compass rose. Fred Sawyer, president of the North American Sundial Society (NASS) is quoted by Erik Lacitis, Seattle Times staff reporter, saying “it’s likely true that Sullivan’s garage sundial is one of the best in North America.” When the NASS visited Seattle for the 2011 annual sundial conference, they visited Woody’s Reflection Dial and a marker was added to it for the date and time of itsofficial dial dedication held on Saturday 22 August 2011. “We toasted the sundial with an appropriate wine, ‘Wehlener Sonnenuhr’ by Joh. Hos. Prum, the fine Mosel Kabinett from the German vineyard with a large vertical sundial.” said Roger Bailey, the society’s secretary.